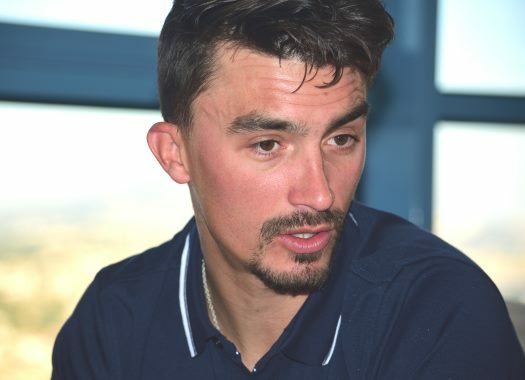 Deceuninck-Quick-Step's Julian Alaphilippe has been another of the riders involved in the day's massive crash at Itzulia-Vuelta al Pais Vasco. Rider and team will decide his continuation in the race before the start of the fourth stage. Alaphilippe took the victory of the second stage of the Spanish race and finished that day in the second position of the overall classification. But the third day had worse news for the rider as he was involved in the crash that affected the peloton at seven kilometres from the finish line. "It doesn’t look to be anything serious, but I have some abrasions and pain, so the team will continue to monitor me overnight," he commented. "I really don’t know what happened, just that it was a touch of wheels in front of me and in the next moment I was on the ground. "It’s the first time in my career that I crash at high speed, but at the end of the day, I am happy I could finish the stage. The only thing that we can do now is to see how things go and how I feel in the morning."